CIMB Bank Cambodia will look to expand into the Kingdom’s fledgling capital market, as well as into its maturing microfinance sector, Nazir Razak, the chief executive of Malaysia’s second-largest bank, CIMB Group, says. The relatively limited scale of Cambodia’s banking sector, coupled with the more than 30 banks that experts say already overcrowd the space, would push regional banks such as CIMB to diversify their services, Razak said last week on the sidelines of the CIMB ASEAN Conference in Kuala Lumpur. CIMB opened a bank branch in Phnom Penh in late 2010. By the end of next year, it should have 10 to 12 branches, Razake said. Cambodia must continue to invest in its human resources and technology for the banking sector to catch up with regional standards, Razak said. Given the the size of the Cambodian market, domestically owned banks would also need to eventually look beyond their borders to find economies of scale, he said. Malaysian banks such as CIMB, Maybank and Public Bank have done as much in the region, even with a population of 28 million that earned US$8,363 per capita in 2010. Cambodia’s 14.7 million people brought in slightly more than $900 per head last year, according to Ministry of Economy and Finance data. Malaysia’s Maybank became an incorporated subsidiary in Cambodia in April, betting on what Maybank CEO Abdul Wahid Omar said was a low banking-penetration rate in the country. Although the numbers are disputed, a World Bank report released last month showed Cambodia at the bottom of the list in terms of bank use in the Asia-Pacific region. Only four per cent of Cambodians had formal bank accounts, and just one per cent saved money at a formal financial institution, it said. 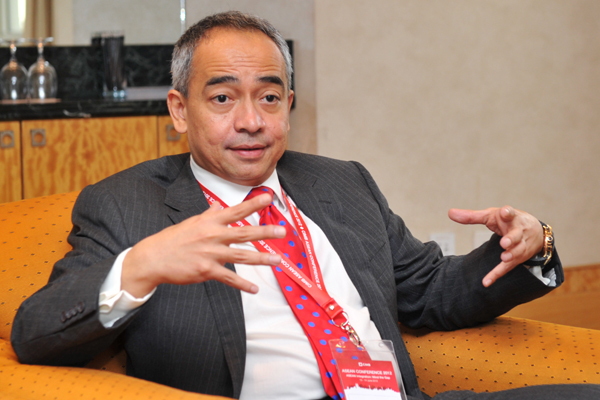 Razak noted the sector’s low penetration rate, but agreed with most industry insiders on the need for smaller banks to consolidate. “My view is that it’s fine if the central bank wants to proliferate the number of licences, but over time the right thing to do is to have consolidation. Although Razak did not give a time frame for consolidation, he said the market would most likely end up with about 10 banks.